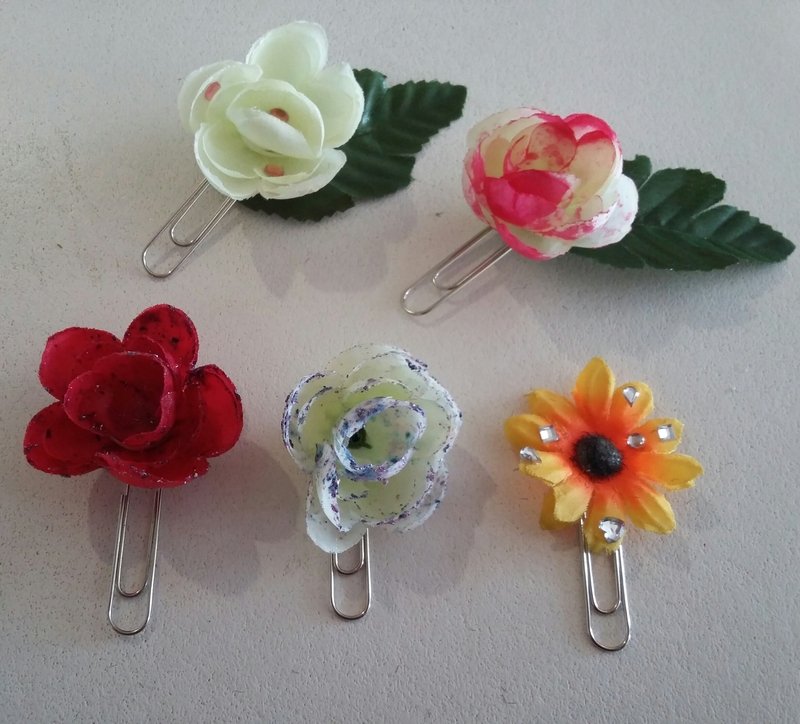 This is a pic of my flower paperclips. You can use them in your planners/ binders, books or wherever else you use paperclips. Plastic flowers with the leaves (preferably white and flowers that you can squash a bit so the flatten out and are not too puffy). Nail polish with glitter OR glitter and clear nail polish OR glitter spray ( I didn’t have glitter spray which is why I chose nail polish. Also nail polish stains cloth which in this case is good cause it won’t budge). Glue (ask for glue that sticks metal to cloth). Grab your bouquet and cut your flower off it. There are plastic bits behind your flower. You need to cut them off too! Flatten the flower a bit (gently) so it is not as puffy. Take some nail polish and pour a small bit onto paper (not cloth cause it will get absorbed more quickly). Dab your flower onto the nail polish and let it dry. Depending on how glittery you want your flower to be, you dab more. TIP 1: I chose red and white flowers. TIP 2: If you don’t have nail polish with glitter,then use glitter and clear nail polish. I didn’t have glitter either, so I looked round my house and saw this vase full of stuff with glitter. I shaked that a bit and viola… I had glitter! Wait for flower to dry. 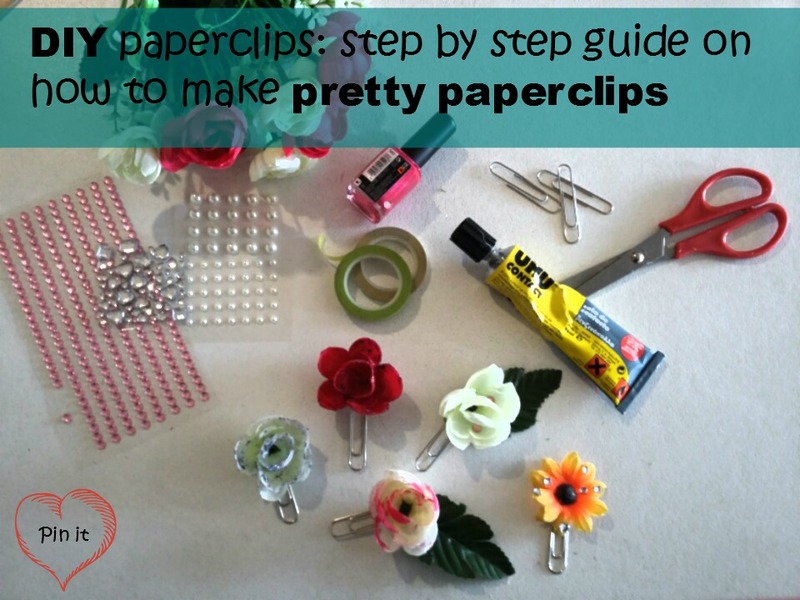 Put washi tape on your paperclip so you have a flat surface to glue your flower on. Stick your flower onto the washi. Keep it pressed for a while and then let it dry. Back to your bouquet. 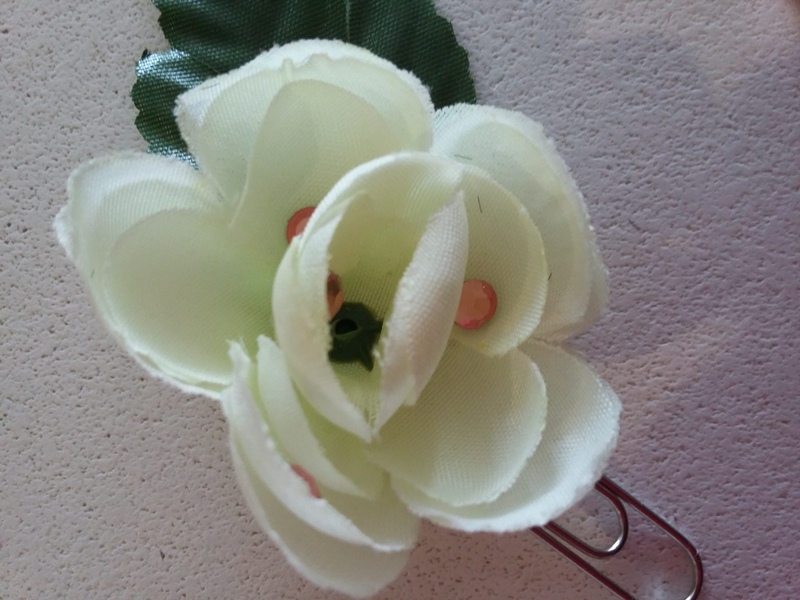 Cut off the leaves and after your flower has stuck to your paper clip, stick the leaf on the other side. Press it for a while. By adding the leaf you cover the washi on both sides. Let your paper clips dry. Well, I got little stickers that have fake drops (like diamonds) and pink diamond stickers from a crafts supply store . I stuck those onto my flowers to mimic a kind of raindrop effect. Durability depends on how gentle/rough you are with your paperclip. I have not had any problems. If you don’t have any of these things at home, you can get some from Amazon. I did a little search and found some fairly inexpensive items (these are affiliate links which means I get a small commission from your purchase, but the price for you is the same). Get this here. Current price for 780 pieces:$5.99. You can get this here. Current price $3.99. 🙂 Subscribe to my blog if you like what I have to say. onnect with me on Pinterest/ Twitter/ Instagram.Maybe even give my Facebook page some TLC? Remember the comments section is all yours. These are so creative – what a wonderful idea! Good work. I should show this to my cousin. She LOVES to have flowers in her hair haha.